Improve safety and operations at the intersection of KY 842 (Richardson Road) and US 25 (Dixie Highway). Reconstruct KY 842 from west of US 25 to the Boone County line to a two or three lane urban section that includes curb and gutter. Include multi-use paths along both sides of the roadway. 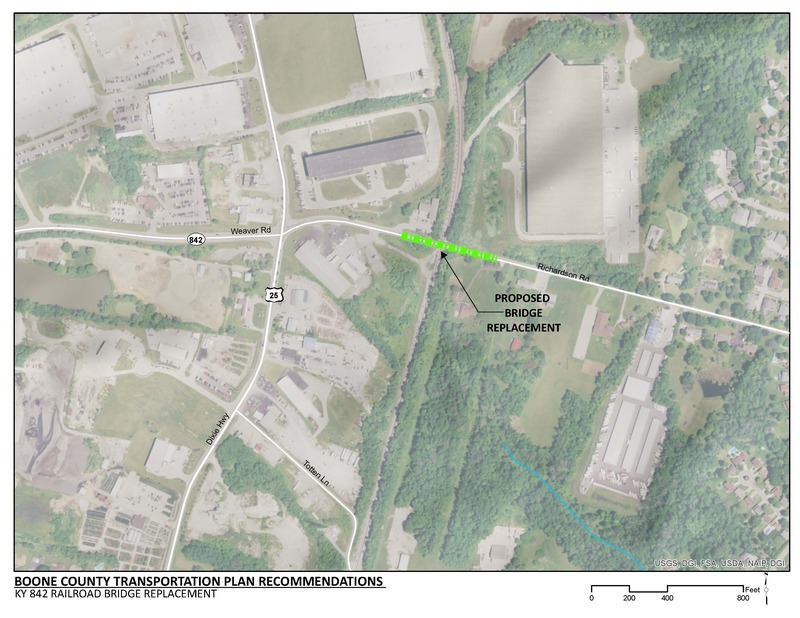 This recommendation will improve traffic operations at the US 25 intersection with KY 842. Additional capacity along KY 842 will improve congested conditions along the roadway. In conjunction with the KY 842 improvements recommended in the Kenton County Transportation Plan, this project will provide a continuous improved section from KY 1303 (Turkeyfoot/Bristow Road) to US 25. Overhead utilities were identified along the north side of the roadway which may be impacted. Implementation of this project will also require reconstruction of the KY 842 bridge over the Norfolk Southern Railroad. The KY 842 intersection with US 25 is misaligned and congested. Commuters use this corridor as a key east/west connection between Dixie Highway in Boone County to KY 1303. The Northern Kentucky Area Planning Commission projects 100 acres of commercial, 122 acres of industrial, and 100 acres of residential new developments immediately to the north and south of the Richardson Road corridor. A variety of residential neighborhoods flank this project area and provide a range of housing options from single family on one acre lots to multi-family, rental properties with as many as ten units. There are three TANK bus stops for route 28x located between US 25 and the Richardson Road bridge over the Norfolk Southern Railroad. There are multi-use paths included in the KY 842 improvement recommended in the Kenton County Transportation Plan.